Non-operating owners of ageing gas-guzzling small containerships are likely to renew their interest in scrapping as the charter market makes an unexpected U-turn. The latest idle tonnage report by Alphaliner records 131 ships of 500-5,100 teu in hot or cold lay-up seeking employment, compared with just 56 in February. The consultant notes an “alarming increase in spot tonnage under 1,000 teu”, with some 25 ships seeking fixtures, more than double the number it recorded in mid-June. Alphaliner’s idle tonnage total at 23 July was 142 vessels for 341,229 teu, representing 1.6% of the global fleet. At the end of May, the numbers were 85 vessels for 205,829 teu. Notwithstanding the usual seasonal downturn in fixtures, a rush of service cancellations and mothballing of new services by embattled ocean carriers scrambling to turn a profit has weakened demand in recent weeks and reversed the upward trend in daily hire rates. One London-based broker told The Loadstar his owners were “frustrated” at the sudden turn in the market. “Only a few months ago they were in the driving seat and able to dictate terms, but now we are struggling to get extensions and enquiries are low,” he said. “We are hoping the liners don’t take more radical action after the peak season, as this will put more pressure on hire rates and conditions,” he added. Indeed, the dramatic recovery in panamax rates seems to have come to an abrupt end, with charter party daily hire for recent fixtures coming down around $1,000 to $12,500 in the past month. Alphaliner expects a continued “weakening trend” until September, when higher liner freight rates and a cooling in oil prices could tempt carriers back into the market for tonnage to cover additional loading requirements. The containership demolition market has been in the doldrums for most of this year as owners were incentivised to reactivate ships by the surge in daily hire rates, due to a combination of strong cargo demand and a dearth of smaller tonnage after several years of high scrapping activity and a lack of new orders. In fact, Alphaliner reported that there had not been one containership sent to breakers’ yards in July. 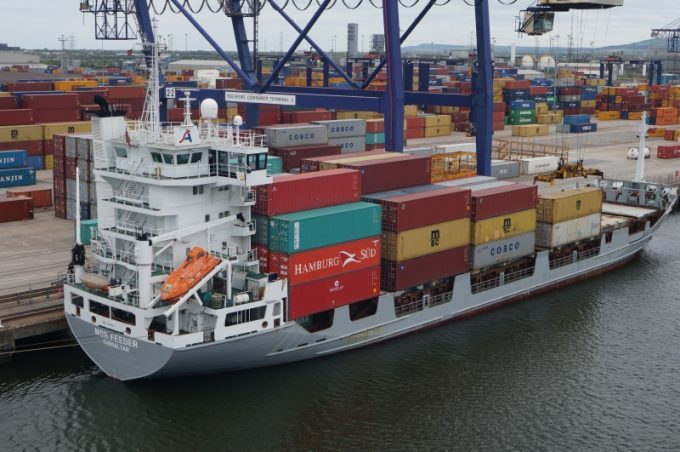 And, according to data supplied by London shipbroker Braemar ACM, just 19 ships equating to 43,000 teu have been scrapped since the start of the year. This compares with 151 vessels for 431,000 teu sold for recycling during the same period of 2017. Faced again with an uncertain outlook on employment and the IMO’s low-sulphur regulations in January 2020, owners of older tonnage may revisit the scrap market where higher demolition valuations could tempt them. Meanwhile, following the focus over the past few years on building large container vessels, shipyards in Asia are reporting a surge of orders for smaller ships. According to Alphaliner data, 34 vessels of between 1,800 and 2,800 teu have been ordered this year. It also notes that Taiwanese carriers Evergreen, Yang Ming and Wan Hai are at the forefront in negotiating newbuilds in the sector with the carriers reported to be on the verge of placing orders for a total of around 50 feeder ships.